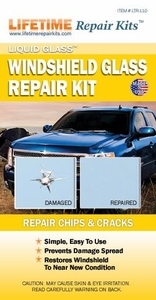 Repair damages to auto, truck, SUV and RV windshields just like the pro's do with this incredible kit. The unique "Liquid Glass" advanced resin compound, combined with our easy-to-use applicator, makes this the best windshield repair kit available to consumers! The windshield repair resin is injected into the damaged "bullseye," or similar damage. The kit comes with complete, easy to follow instructions., and like all of our products, we are there to help you if you call our customer support number.